1 of 2 Place oil, vinegar, 1 tbsp water, mustard, salt and pepper in a small lidded jar. Shake until combined. 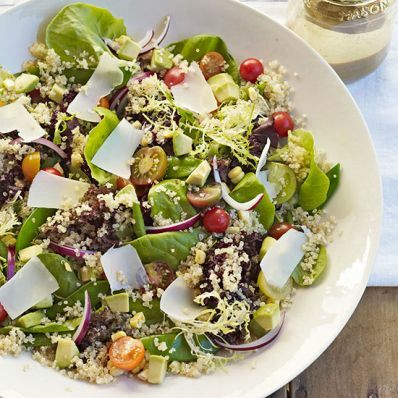 2 of 2 In a large salad bowl, combine lettuces, quinoa, corn, snow peas, tomatoes, avocado and onion. Toss with dressing and top with Parmesan. Serve immediately. Per Serving: 3 g sat. fat, 26 g carb., 15 g Fat, total, 5 mg chol., 253 kcal cal., 312 mg sodium, 6 g fiber, 7 g pro.